It could probably go without saying, our planet’s poles are extreme locations. 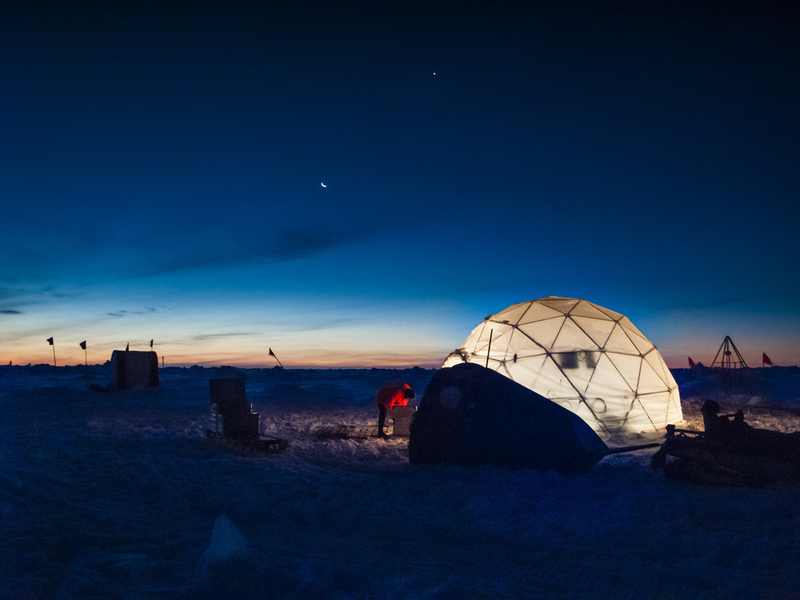 The frigid temperatures, extremely dry conditions, and extraordinary wildlife have often led those trying to describe the poles to look to other planets in an attempt to accurately convey the peculiar environments. It's also why scientists and researchers are turning to Antarctica to learn more about conditions on the Moon, Mars, and beyond. Take for example Don Juan Pond, a bizarre little pond just a few inches deep that remains liquid even in temperatures of minus 58 degrees Fahrenheit (-50 degrees Celsius). So how is this possible? Scientists determined the pond’s unique ability to stay liquid in the extreme temperatures had to do with the unusually heavy and pure load of salt that made it the saltiest body of water on Earth. Gaining a better comprehension of the bizarre body of water has piqued scientists’ interests because better understanding Don Juan Pond will hopefully help them better understand the behavior of similar features observed on Mars. The same could be said of Lake Vostok, an Antarctic lake buried under more than 2 miles of Antarctic ice. It is estimated that the waters in the lake would have been sealed off from the rest of our planet some 14 million years ago. Scientists theorized that the freshwater lake could be home to some cold-loving lifeforms that have existed in the chilled darkness for millions of years, not dissimilar from theories as to the possibility of life on Mars, or even the Moon. Still, the odds of living organisms existing in Lake Vostok shouldn’t be great. The ice above the lake puts the water under extreme physical pressure - similar to the conditions experienced under the surface of Jupiter’s moon Europa - while also cutting it off entirely from the sun. With no outside energy source for millions of years in such absurd physical conditions, many in the scientific community have cast doubts as to whether much could be found in the waters. However, after a host of scientific controversies and logistical challenges, in 2013, scientists finally gained access to the lake waters and confirmed that, not only was there evidence of some forms of life buried down there, but that life might actually be thriving in the ancient lake. More than 3,500 different species were identified within the samples carefully pulled from the waters, though researchers concede much of the living material in the sample could come from contamination or ancient life lying dead but still preserved in the water since the lake was cut off from the rest of the world. All the same, there is little doubt that at least a percentage of the organisms are in fact living in the alien conditions. And then there’s the Dry Valleys. Officially the driest landscape on Earth, the Antarctic valleys have extremely low humidity and almost no ice or snow cover, making them the closest of any of the Earth’s environments to the conditions found on Mars. Scientists have been using the singular environment to test ice-penetrating drills to see which will work best for future Mars missions after NASA’s Phoenix lander found a small patch of soil covering a layer of ice in the Martian polar north region. Researchers theorize the patch could hold evidence that life once existed on the Martian surface. Incredible locales like these are a big part of the reason Antarctica has long captured the imagination of explorers and adventurers looking to push beyond anything recognizable to most people on Earth. So whether you’re exploring Antarctica aboard the 345-ft M/V Expedition on one of our Antarctica Classic; Antarctica in Depth; Quest for the Antarctic Circle; or Falklands, South Georgia & Antarctica expedition sailings, or you’re electing to experience the extreme aboard one of the four state-of-the-art L’Austral, Le Boréal, Le Lyrial & Le Soléal luxury mega yachts, our team of travel experts is ready to help you craft some of the most out-of-this world (but still on this planet) Antarctic trips imaginable.